Synopsis: Laura is a ‘cool finder,’ a person hired by corporations to observe street culture and predict fashion trends. During one of her visits to a local skate park, she encounters Pack, 16, who seems to be a homeless street kid. Pack agrees to help Laura gather information in exchange for money and beer. Soon, the two develop a sort of friendship, and Laura finds herself intrigued with Pack's life story. Matt, who has been in a relationship with Laura for years, is nervous for Laura's safety and interrupts a meeting between her and Pack. A few days later, Pack shows up at Matt's school, wanting to know more about him and his relationship with Laura. Matt soon becomes fascinated with Pack: with his youth, his strength, his bravado, and his freedom from adult responsibility. He befriends Pack under the pretext of wanting to help him find a more stable life, but soon finds himself attracted to Pack. Matt struggles to understand whether this attraction is sexual, or merely jealousy of Pack's youth. Soon, Pack plays a series of games with both Laura and Matt, pitting them against each other and raising doubts about their relationship. Ultimately, Pack runs off, leaving Matt and Laura alone, each trying to figure out how their relationship could be so tenuous, and how to put the events into any sort of context. 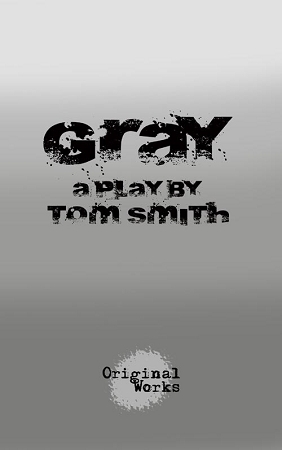 "Tom Smith's new play, GRAY is a bright spot on the theatre scene. His characters are unique, yet universal."